Every Easter the same debate rages across town: who makes the best hot cross buns in Melbourne? What even constitutes ‘best’? Isn’t this all academic because Coles clearly perfected hot cross buns years ago, even if they’re developed in an underground lab by ex-Soviet nuclear scientists? Well who cares—we’re back for another year of (blind) tasting, judging, fisticuffs and fun. 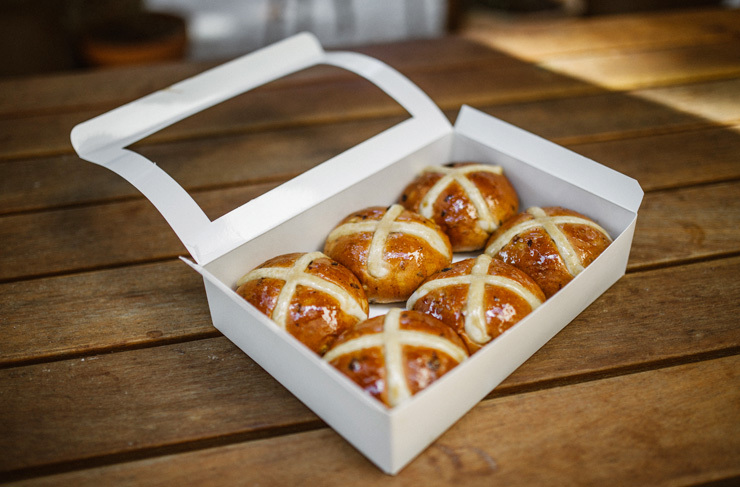 We’ve scoured the city’s best boutique bakers and artisan bread wizards to bring you Melbourne’s best hot cross buns. The 2018 Edit. Taking out the Urban List Hot Cross Bun gong for the second year running, it’s Rustica Sourdough! The undisputed bun bosses of Melbourne. These guys were all about the spice—heavy on the nutmeg, cinnamon and butter (the way nature intended). A dense, home-style dough and just a smidge of gloss on top. Head Baker Brendon Lang spent 20 years perfecting these bad boys, and f*ck it was worth it. Grab the car keys and head to Sydney Rd, STAT. There’s a French baker there doing some frankly insane hot cross buns. Choukette's buns aren’t really comparable to anything else. They look rustic and hand-made. The cross is more of a rough white slash. And the texture...dear god the texture. These things somehow manage to be dense, fluffy and moist all at the same time. The fruit ratio is slightly lower than other brands, but that just leaves more mouth space for the dough. French flour maestro Quentin Berthonneau opened Q Le Baker in Prahran Market this year, and hot damn he’s hit the ground running. These are old-school French hot cross buns: think, small, glazed, dense, heavily spiced and studded with raisins and peel. Some artisan places overcook their buns, but Quentin manages to keep the moisture locked in there. These things under the grill, a wodge of French butter and a double shot cafe au lait...happy days, baby. Baker D used to be all about the traditional buns, but this year they’ve unleashed a chocolate variety...and it pretty much fried our brains. They’re not the sexiest looking buns (think low-gloss, knobbly choc rocks), but the chewiness of the dough, the perfectly melted nuggets of chocolate, the subtle spice and kick of hazelnut...hot damn. In this case the D stands for Delicious. Agathé out-did herself this year. She invented a hot cross croissant. And before you shout ‘Gimmick!’, put this thing in your mouth and move your teeth up and down. The spices and fruit combine perfectly with the butter-rich croissant dough. It’s crispy, moist, spicy and effing addictive. Agathé even pipes white icing crosses on top of each one. Highly recommend. Ned Radojcic from Ned’s Bake is an engineer by trade, but damn the man can bake. He’s been sampling hot cross buns and tinkering with his recipe for months. The result? Bloody unreal. Sticky, glossed buns, a little crusty on the outside, still fluffy on the inside, with the spice-factor dialled up to 11. “There’s nothing worse than a bland hot cross bun,” says Ned. Damn right. If you’re a fan of the Coles-style buns, give Noisette a try. They’re like Coles buns on 10-speed. These things are outrageously fluffy, half cloud, half bun, half poodle. If you dropped one from a tall building it’d probably float away like a helium balloon. The flavour is on the generic side of the scale (think less spice and fruit than other brands), but some people prefer a milder bun—it leaves more room for butter. This one’s a tie between Candied Bakery in Spotswood and Mörk, the gods of artisan hot chocolate. Let’s start with Candied—these buns look like hot cross buns do in cartoons. Slightly larger than normal, not too dark and not too blonde, a huge shellac of sugary gloss on top, and the perfect piped cross. Proper stunner. The Mork chocolate buns...well. When we unwrapped the box the office actually gathered around to stare and take photos. There’s so much glaze on the chocolate that if you threw a bun at the wall it’d stick there. Grab a box for the chocoholics in your life. We HAVE to shout out to Max Brenner for their cute-as-a-button chocolate hot cross mini buns. 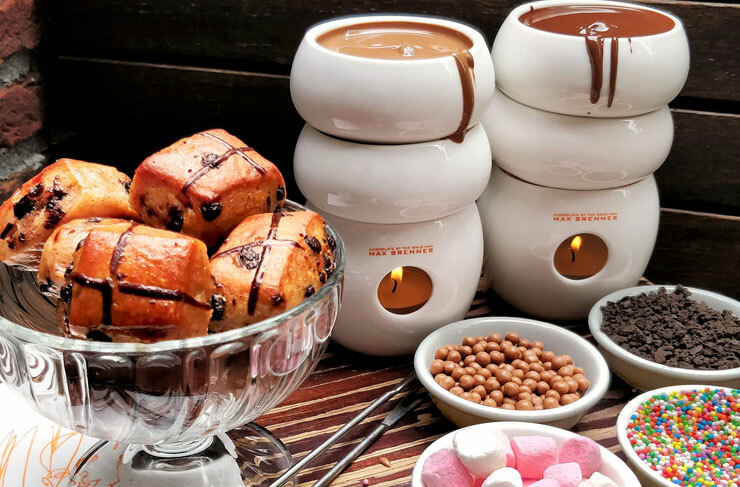 Each one’s about 2cm square, stuffed with A-Grade Max Brenner choc, and comes with a pot of liquid chocolate dipping sauce. Be still our arteries... Just whack ‘em in the microwave for 10 seconds and watch them ooze. Just FYI, they're also doing a special Easter Sundae. Gontran’s chocolate buns were a close runner-up in the Best Choc Category. These are French-style, which means there’s a moist bounciness to the dough, and they’re made from proper artisan chocolate—none of this cocoa powder nonsense. The final product tastes as good as everything else that comes out of Gontran Cherrier...enough for our tasters to go back for thirds, fourths...and fifths if we’re honest. Dench is renowned for a killer hot cross bun, and they didn’t disappoint this year. These guys puree whole oranges and add them to the batter, which not only gives the bun a fruity flavour, but locks in some of the moisture. You can usually also pick these guys up from Dench’s sister cafe, Bread & Jam for Frances in Hawthorn. Dear God, the Oasis Brioche Nutella Hot Cross Bun...Baker Steve Routley has cranked things up a notch in 2018. These things are piped with a cross of warm Nutella, but there’s also a pocket of liquid hazelnut gold waiting for you INSIDE the bun. Half hot cross bun, half Nutella doughnut. There’s nothing traditional about these things, but who the hell cares? Special shout out to their brioche regular buns, which had one of the best textures we tried all day. 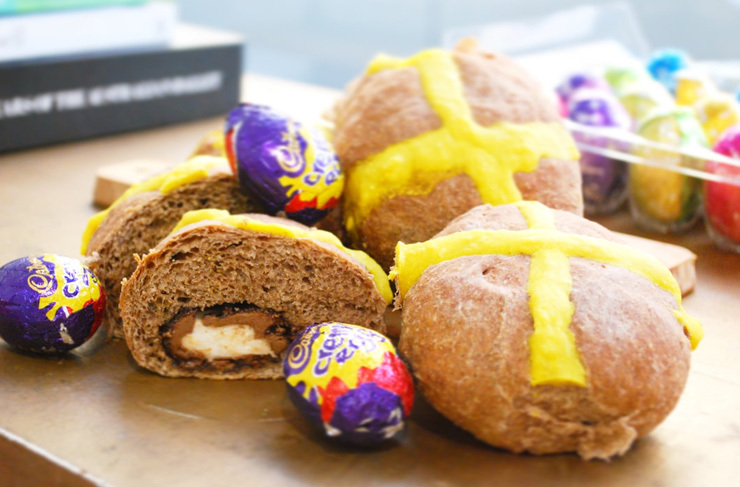 Proof has come up with something new this year: freaking Cadbury Cream Egg Hot Cross Buns. (Like you weren’t gonna put on enough weight over Easter...) Pro tip: don’t cut these things right away. First, whack them in the oven or microwave for 15 seconds, then slice ‘em in half and watch the buried Cream Egg ooze out the middle. The only thing that might have improved these guys is a bit of fruit in the batter, but we’re just splitting hairs. Check out their full delicious Easter Range over here. 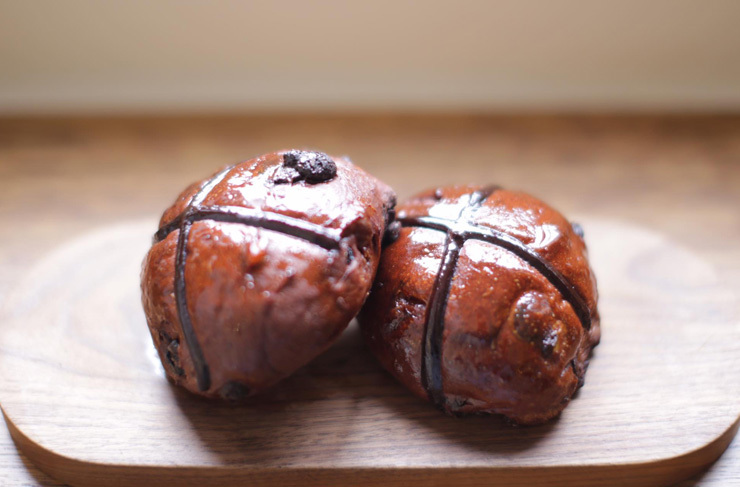 Big ups to The Crux & Co for some of the most uber-luxe hot cross buns we’ve ever seen. Even the wrapping looked good enough to eat. The buns themselves tasted like pure money: rich and dense, stuffed with raisins as big as your fist. It’s gonna take some serious mental strength to walk into Crux & Co and ONLY leave with hot cross buns. Our advice: don’t fight the urge. These guys know their way around a pastry bag. We've always been big fans of STREAT, and they clinched a place in our hearts this year with their ultra-sticky glazed hot cross buns. Not only are these bad boys absolutely delicious, every pack goes toward fighting youth homelessness, providing in-house hospitality training and support for disadvantaged teens. Dig deep guys. You can snag a pack of six for $16. Want to catch up on last year's buns? Here's our hot cross round-up from last year.